Waldsteinia fragarioides var. fragarioides has a widespread distribution in eastern North America, ranging from New Brunswick and Maine to western Quebec, south to Arkansas, and to mountainous regions of Georgia and Alabama. While the species is considered stable and secure over its entire range (NatureServe 2011), it is relatively rare and potentially vulnerable in Minnesota, which is at the far western edge of its range. The same is true in other edge-of-range states and provinces such as Arkansas, New Brunswick, Maine, and Connecticut (Gleason and Cronquist 1991; NatureServe 2011). In Minnesota, W. fragarioides var. fragarioides is restricted to forested sites in the northeastern part of the state. The earliest collection of the species is from 1893 in Lake County. It was later collected by Olga Lakela at several locations in St. Louis and Lake counties between 1938 and 1956. Relatively few records were reported in the 1980s but since that time, over 30 observations have been documented. Some of these observations are clustered, with sites within a few miles of each other. Separate observations may actually be part of one larger population. Taking this into consideration, there are probably just over 20 populations that have been observed in the state since 1990. 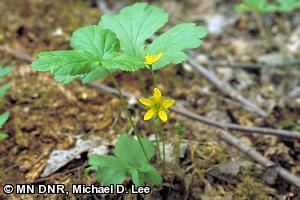 Due to the limited number of observations before 1980, it is difficult to determine whether W. fragarioides var. fragarioides has increased or decreased in Minnesota over the last 100 years. It may have always been rare in the state. Where W. fragarioides var. fragarioides is found, it can be locally abundant and form large colonies. Some of Minnesota's populations are quite large, with 100s, 1000s, or even 10,000 stems at a site. However, the total number of populations is fairly small and the genetic diversity within a given population may be low since much of the reproduction is likely to be vegetative. The forested habitats of W. fragarioides var. fragarioides are threatened by land use changes, including development, certain forestry and recreational activities, and the spread of invasive species. Given its limited geographic range, the relatively small number of populations in the state, and potential threats to its habitat, W. fragarioides var. fragarioides was listed as a special concern species in Minnesota in 1984. Waldsteinia fragarioides var. fragarioides is a low-growing perennial plant that is 10-18 cm (3.9-7.1 in.) tall (Fassett 1976). Its appearance resembles that of strawberries (Fragaria spp.). The evergreen leaves arise from a central base and each leaf is 3-parted. Leaflets are narrowed to their bases at an acute angle. Leaflet stalks are very short and the leaflet tips are irregularly toothed and lobed. The yellow flowers have 5 petals, 5 distinct sepals, and a profusion of stamens. Flowers are borne on leafless stalks arising from the base of the plant (several flowers per stalk). There are 2-6 dry achenes, each containing a single seed (Fassett 1976; Gleason and Cronquist 1991). In Minnesota, W. fragarioides var. fragarioides grows both in fire-dependent forests and in mesic hardwood forests. It is often found in forests dominated by pine, including Pinus resinosa (red pine), P. strobus (white pine), or P. banksiana (jack pine). It is also found in mixed pine and hardwood forests, often with Populus tremuloides (quaking aspen), as well as in hardwood forests dominated by Acer saccharum (sugar maple). It is sometimes observed growing in deep shade, but perhaps most often in woodlands with small openings or relatively open tree or shrub canopies. It is also found growing in full sun along roadsides. Waldsteinia fragarioides var. fragarioides seems to tolerate quite a range of soil types and soil moisture conditions ranging from mesic to dry-mesic. It is not found in peat, muck, or wet soils. All Minnesota occurrences are located in the Laurentian Mixed Forest Province, mostly in two ecological sections (Northern Superior Uplands and Northern Minnesota Drift and Lake Plains Section). There are several observations at St. Croix State Park, which is located in the Western Superior Uplands ecological section. Frequently associated species include Eurybia macrophylla (large-leaved aster), Anemone quinquefolia var. quinquefolia, (wood anemone), Clintonia borealis (bluebead lily), and Maianthemum canadense (Canada mayflower). In Itasca County, a set of observations close to each other (probably one large population) are associated with Epigaea repens (trailing arbutus), Goodyera tesselata (tesselated rattlesnake plantain), Chimaphila umbellata ssp. umbellata (pipsissewa), and Gaultheria procumbens (wintergreen). Nothing specific is known about the biology and life history of W. fragarioides var. fragarioides except what can be inferred from its morphology and habitat. For example, it seems to spread extensively by rhizomes, forming large colonies by the lateral growth of these underground stems. It produces only a few seeds per plant per year. Each flower produces two to six seeds and there are few flowers per plant (U.S. Forest Service 1999). Vegetative reproduction may be more important for the local spread of the plant rather than sexual reproduction. This may make it difficult for the plant to spread longer distances, simply by the limitation of having few seeds produced. Sexual reproduction is probably accomplished by insect pollination but specific pollinators are unknown (Hill 2003). The species appears well adapted to early and mid stages of forest succession (sometimes including disturbed habitats such as roadsides) and it also persists under mature forest canopies (NatureServe 2011). The best time to search for W. fragarioides var. fragarioides is when it is in flower, from May to June . However, since the leaves are evergreen, it could be searched for year-round. Waldsteinia fragarioides var. fragarioides tolerates some disturbance and may even benefit from certain types and levels of disturbance, especially those that are within the the range of natural disturbance which shapes the landscapes where this species is found. Several of the known populations are in pine plantations and along roadsides where the nature of the disturbance was such that at a minimum it did not eliminate W. fragarioides var. fragarioides from the site. It is possible the species benefits from fire. However, the role of fire in the life history of W. fragarioides var. fragarioides is poorly understood and any use of fire as a management tool should probably be infrequent since the landscape where the species is found would not have burned frequently (U.S. Forest Service 2000). The effects of forestry management practices on W. fragarioides var. fragarioides are largely unknown, although clearcutting, rock-raking, aerial spraying, and construction of logging roads are considered threats. Habitat loss from development is another threat with at least one population known to have been destroyed by development activities. The spread of invasive species, recreational activities, trail development, and climate change are other potential threats (Hill 2003; NatureServe 2011). The best way to protect W. fragarioides var. fragarioides is to protect and manage sites where it is known to occur (U.S. Forest Service 1999). Efforts have been made by the U.S. Forest Service and the Minnesota Biological Survey to search for W. fragarioides var. fragarioides. Over half of the known populations (including some of the largest ones) are on public land owned by the U.S. Forest Service and the Minnesota DNR. Several known sites have been protected from logging on U.S. Forest Service lands. The critical information needs for W. fragarioides var. fragarioides as suggested by the U.S. Forest Service are to find out 1) how the species responds to disturbance (since the species may respond favorably to disturbance) and 2) why the species hasn't spread on the Superior National Forest (U.S. Forest Service 2000). Fassett, N. 1976. Spring flora of Wisconsin. University of Wisconsin Press, Madison, Wisconsin. 424 pp. Hill, S. R. 2003. Conservation assessment for Barren Strawberry (Waldsteinia fragarioides ssp. fragarioides) (Michx.) Tratt. U.S. Forest Service, Eastern Region, Milwaukee, Wisconsin. Accessed 21 January 2011. U.S. Forest Service. 1999. Population viability assessment in forest plan revision. Statement of purpose and reason. Draft species data records: Waldsteinia fragarioides. United States Forest Service, Region 9, Milwaukee, Wisconsin. 8 pp. U.S. Forest Service. 2000. Population viability assessment in forest plan revision. Questions for plant population viability assessment panel: Waldsteinia fragarioides. United States Forest Service, Region 9, Duluth, Minnesota. 4 pp.